When Waiouru was fitted out we ran wiring for six speakers in the saloon ceiling. Whilst the speakers were installed during the final stages of the fit out they were not connected into the media system. Actually they need to connect to the external sound sockets on the TV. After some research I found a small 12v amplifier on eBay for £6.99, including free delivery. The only error was failing to read the seller was located in Hong Kong. 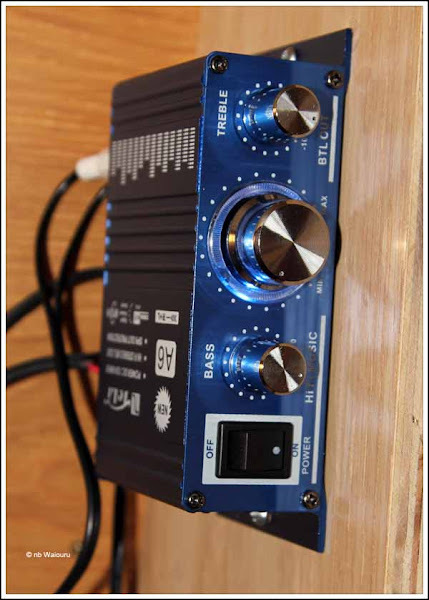 However after a short (two week) delay the amplifier arrived and has been connected into the system. It has been mounted vertically in the cavity behind the TV where it’s out of sight. The location is rather fortuitous because the amplifier has dual coloured flashing leds which illuminate the knobs when turned on. It also produces far more power than we are ever likely to need inside the boat. (well at our age). I still have to tidy up the wiring. We are apparently the proud owners of a second Samsung Galaxy S i9000 smartphone. Our first phone was purchased as a “parallel import” from Malaysia whilst we were living in Australia and is our communications “lifeline” providing both voice and unlimited internet. The model has already been superseded by the Galaxy S2 but it does everything we require, so why purchase something more expensive. Eventually the current phone will ‘pass on to phone heaven’ (component failure) which is why the second phone has been purchased. How did this happen? Well I noticed a new Galaxy S i9000 was for sale on eBay with about six serious bidders vying for it. The bid price was steadily rising and there were two days left before bids closed. Then I noticed a second phone with a starting bid of £99. This was more expensive that the current bid on the first phone (£60), however the bidding for the second phone was scheduled to close before the first. I decided £99 was about the right price so rather than get into a bidding war with the other six bidders (and potentially lose), I opted to watch the second phone and placed the only bid 20 seconds before the auction closed. As it stopped raining this afternoon I took the Kipor generator out of storage and decided to give the domestic bank a thorough charge. It wasn’t really necessary as we’ll be on shore power in a couple of days, but I want to ensure the Kipor is empty of fuel and also complete an oil change. The generator ran for three hours and by then the Smartgauge was showing 100% and the Victron BMV display showed the batteries were accepting 0.8A. No doubt we’ll improve on that when the batteries are on shore power over winter. I had a “seniors moment” when the generator was running thinking that we might accidentally flatten the batteries if the shore power 240v supply was to fail without us realising it. Then I remembered if we switch the Victron to ‘Charge’ the 240v side of the boat is supplied by the shore power and the batteries cannot supply the inverter. It will actually be a good way of identifying the shore power has failed and enabling us to switch back to running the engine and using the batteries.